Does an ERP implementation make sense for your organization? Are you considering an ERP implementation for your organization? Before you decide, learn what questions you should be asking about your ERP goals, business requirements and getting the highest ROI for your investment. Some ERP industry analysts predict that, in 2009, many companies will avoid investing in new ERP software due to the economy. However, our data tells a different story. Here at Panorama Consulting Group, we see an increase in the number of companies that want to use the downturn as an opportunity to implement new enterprise software using available resources. A recent poll on our website indicates that 55% of respondents are planning either to start or continue implementing new ERP systems in 2009. There are three main reasons why many companies see 2009 as an ideal time to deploy new ERP enterprise software. A slower economy affords companies the opportunity to use their resources and employees to help implement the software correctly. Because many ERP software vendors are aggressively pricing their solutions in response to a slowing economy, clients are now able to procure an ERP solution at a lower cost than in years past. There are winners in every downturn, and this one is no different. Some clients are continuing to grow despite, or as a result of, the current economy, and these companies are investing in enterprise software that can help them scale for growth. Businesses need to understand the potential benefits and risks of a new ERP system. ERP is not for everyone. If your company is in in high-growth mode or your current system and your business processes do not match up, then it may be time for a new system. On the other hand, if your current system works fine and you are not experiencing these types of problems, a new ERP system may be more costly and riskier than it's worth. Planning for an ERP implementation involves more than choosing the right software. It also involves preparation to ensure that ERP enables measurable improvements to your business. 1. Why do you want to implement ERP? Before making a decision as weighty as implementing a system that will cost millions and affect your entire company, you need to know what you want to accomplish by taking on this challenge. There may be more cost-effective and lower-risk options, such as improving processes, redesigning your organizational structure, consolidating your global supply chain, or implementing a performance management system. 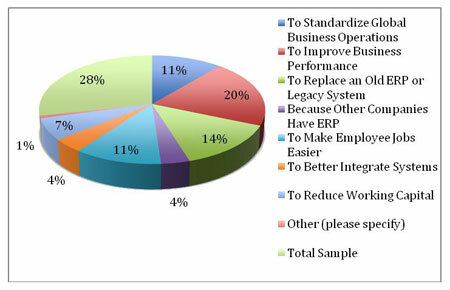 In these cases, choosing not to implement ERP may be the best solution. On the other hand, ERP may be the business tool that enables these improvements. 2. What are your business requirements? If you need to go the ERP route, you'll need to use your desired operational model as a starting point in determining which software to implement. Executives should define and document key business requirements for any package they may select. This includes not only nice-to-haves but also requirements that are "deal-breakers" if the software is unable to accommodate them. In addition, executives should use the process of defining ERP business requirements as an opportunity to improve current operations, efficiency and effectiveness. The last thing a company should do is implement software to automate the same flawed business processes. The focus should be on achieving measurable business value for your organization, and you should choose the software that best enables you to do this. 3. What is your business case and ROI? This is where many companies fall flat. You need to document what your total costs will be for each ERP vendor under consideration, as well as your anticipated business benefits. This is important in gaining approval from other executives or your board of directors, and it helps ensure that you realize the potential benefits of implementing ERP. All costs -- including hidden project costs such as internal project resources, data conversion, and lost productivity immediately following go-live -- should be included in the business case and ROI calculation for each ERP vendor you evaluate. If the resulting ROI for a particular ERP vendor neither makes sense nor meets minimum investment criteria for your company, it's probably not a good idea to undertake the project. Once you've determined that ERP is the right path for your company, you'll want to select software that best fits your business requirements and operational model. Executives may choose ERP software vendors based on what their competitors or other large companies have chosen. Is there such a thing as choosing the "right" software? It relates to both the ERP technology itself and the requirements of your specific company. The information you need will not only help you "choose" the ERP software, it will also prepare you with the knowledge to select and implement ERP and have measurable improvements to your business.